I will admit that I watch TV, commercials and all. Sadly my inability to admit this fact to myself starting with the invention of the DVR, Netflix, or even say the internet, has resulted in the viewing of whatever has been coming through the rabbit ears at the moment I want to turn off my brain. Oh how I wish I could take back some of those hours. I recently described an older friend of mine to a younger colleague as "the spitting image of Peggy's grandfather on King of the Hill." Yes thats right, I know what peggy's grandfather on King of the Hill Looks like, and its my friend Floyd. That said I was happy to start using my friends Netflix account and engaging slightly more worthwhile material without the commercial interruptions. I began this excursion appropriately with Mad Men, which I must say is utterly fantastic. 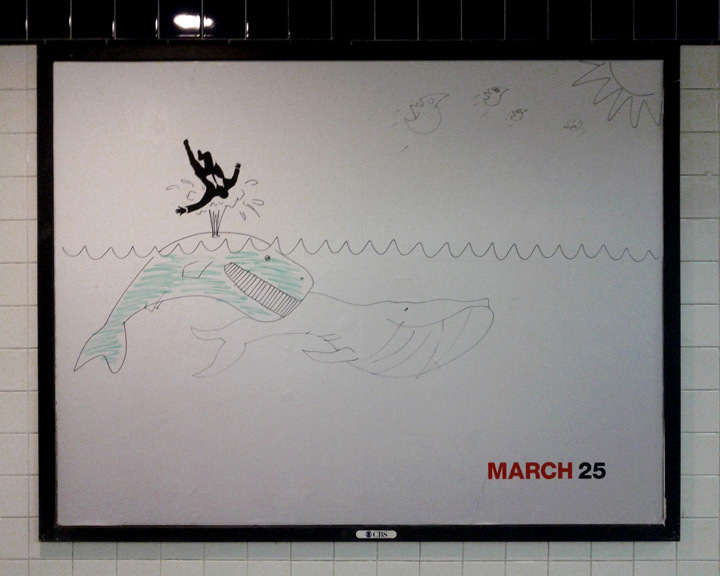 Recent advertisements for season 5 have flooded the NYC subway system and with their stark graphic design have begged for commentary and alteration. The image above is my favorite so far but ill keep my eyes out for something that trumps the sheer frivolity of playful whales defying Don Drapper's imminent fall from grace.